Overview - In one of the darkest times in Chinese history, a devastating famine during the war ravaged parts of the country. This human tragedy that killed millions must never be forgotten. More than just a simple tool for escapist entertainment, under the right hands, cinema can also be a meaningful vessel for thought provoking historical accounts, enlightening and teaching audiences about terrible tragedies while exposing certain important realities we might otherwise wish to ignore. Spielberg's 'Schindler's List,' is perhaps one of the best examples of this type of socially/historically significant filmmaking, tracing the horrors of the Holocaust while also telling a deeply human story about sacrifice and compassion. Xiaogang Feng's epic Chinese drama, 'Back to 1942,' has similar artistic ambitions, revealing the gut wrenching true story of the devastating famine that swept Henan, China during the Second Sino-Japanese war. Filled with solid production values and sometimes impressive visuals, the movie weaves an utterly devastating experience. Unfortunately, the runtime gets so buried underneath unrelenting misfortune, that the film ends up lacking fully engaging characters and emotion. It's powerful in isolated instances, but sadly loses focus within its ambitious scope. Based on the novel "Remembering 1942," the film takes place during the winter of 1942 as a terrible famine sweeps across the Henan province of China. Though first caused by draught, the lingering war with Japan further complicates matters, leading to callous decision making from the government, which refuses to send proper aid. A wealthy landowner, Fan Dianyuan (Guoli Zhang), is forced to flee from his home with his family in search of better conditions. Joining a massive exodus, the group struggles to survive the harsh weather and constant threat of aerial bombings while their food supply slowly dwindles. Meanwhile, an aging governor, Li Peiji (Xuejian Li) attempts to secure proper government relief for the starving refugees but is constantly met by resistance from his superiors. Likewise, an American journalist, Theodore Harold White (Adrien Brody), takes it upon himself to cover the story, hoping to secure enough evidence of the deadly disaster to force the government to act. Taking a multifaceted look at the harrowing conflict, the movie covers the famine from all sides -- and this proves to be both a strength and a detriment to the proceedings. By following both the starving villagers and corrupt politicians, the story brings different perspectives to the tragedy, paralleling the poor policy making in the government with the actual results of their terrible decisions. Unfortunately, this fractured storytelling leads to an uneven experience, and by spreading the focus around to so many different narrative threads, we don't end up spending enough time with certain storylines or characters. Fan's journey becomes the heart of the film, but as his predicament becomes more and more dire we gradually lose sight of him as a character -- and instead he merely becomes a means to expose one disturbing account of human suffering after another. While the movie offers an utterly distressing depiction of its tragic events, it periodically lacks tangible human substance beneath the horror. The absolute worst of humanity is revealed as the starving refugees are forced to make unspeakable decisions in the face of such horrendous circumstances, and though bursts of hope and kindness are peppered throughout their turmoil, there is rarely much relief from the onslaught of misfortune. This results in an occasionally powerful but often uncomfortable viewing experience. Despite the relative lack of characterization, the performances are still impressive. Guoli Zhang handles Fan's transformation from wealth to squalor well, and his increasing desperation eventually proves to be affecting. Adrien Brody is also solid, bringing a palpable sense of determination to his journalist character, though his screen time is comparatively minor. Tim Robbins is much less effective, however, in a throwaway role as a priest with an oddly indistinct accent who shows up briefly in a few early scenes and then completely disappears. As the powerless governor struggling to help stop the famine, Xuejian Li carries a quiet dignity and his scenes are all elevated by the actor's likeable presence. As a whole, the groundwork and potential for more interesting character development is all here, but the film's more visceral focus on the overarching atrocities of the crisis ends up under-utilizing the cast. Making the most of his budget, director Xiaogang Feng does a commendable job of creating an epic, melancholy atmosphere. The production design is impressive, utilizing authentic sets, locations, and wardrobe choices to effectively bring the time period and deplorable conditions to life. Though some of the CG effects are a little shaky, a few air raid sequences are legitimately intense and Feng fills the film with forceful swells of graphic, brutal wartime horrors. The mass migration is tragically brought to life in all its devastating breadth, and the filmmakers bring an appropriate sense of scope to the proceedings, really exposing the horrifying scale of the escalating crisis. 'Back to 1942' is an inconsistent but nonetheless worthwhile exercise in epic, historical awareness. Though potently frustrating and disturbing, the movie periodically loses emphasis on its central characters, causing some of its gruesome sequences and political discussions to feel emotionally detached. It's not a wholly successful endeavor, but their is genuine power in the story it tells -- though be warned, the disturbing content won't be for everyone. 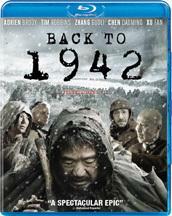 Well Go USA brings 'Back to 1942' to Blu-ray on a BD-25 disc housed in a keepcase with a cardboard slipcover. Some skippable trailers play upon start up before transitioning to a standard menu. It should be noted that the trailers are mixed rather high, so you might want to lower your volume before inserting the disc. The packaging indicates that the release is region A coded. The movie is provided with a 1080p/AVC MPEG-4 transfer in the 2.35:1 aspect ratio. Though the cinematography itself is quite striking, subtle but noticeable compression artifacts are periodically visible, hindering the transfer's overall appeal. The print itself is in good shape but there are some fleeting specks and blemishes. A light layer of grain is apparent throughout but, unfortunately, the grain pattern isn't always resolved well, leading to a periodically digitized and clumpy appearance. Faint blocking and noise are also present in isolated instances, occasionally giving the image a slightly compressed appearance that obstructs fine detail and dimension. Outside of this issue, clarity is solid, effectively revealing all the gritty texture in the characters' tattered wardrobes and dirty faces. The color palette is intentionally subdued, offering a fittingly desaturated style prone to sickly yellow, green, and grey hues. Black levels are just a hair light, but shadow detail is strong and contrast is balanced well. 'Back to 1942' actually features some impressive visuals and production value, but this hard work is diminished by some encoding issues. While the film is still very watchable, the compression artifacts are noticeable, degrading what could have been a very strong transfer. Though I can't say for certain, space limitations may have been a factor here (the 151 min feature has been crammed onto a single BD-25 disc). The film is presented with a Mandarin/English DTS-HD Master Audio 5.1 track and Dolby Digital 2.0 track, along with optional English and Chinese subtitles. It should be noted that unlike some other films that feature both foreign and English dialogue, here the English subtitles appear on screen even when the characters are speaking English. Nicely textured and appropriately aggressive when called for, this is a strong mix that is held back slightly by an odd anomaly. Dialogue is clean and full throughout the track, but speech is occasionally joined by a strange and seemingly unintentional echo that can be distracting. I first noticed the effect around the 01:21:14 mark where the dialogue starts to quietly reverberate. The effect comes and goes throughout the remainder of the film, often between different lines of dialogue within the same scene (further reinforcing that it's likely not intentional). Thankfully, though a little distracting, it's relatively subtle and not a huge detriment to the experience. The sound design can be both delicate and assaulting, bringing a convincing sense of layered atmosphere to the film's quiet and loud environments. Sounds move directionally around the room with natural imaging, and the surrounds come alive with ambiance. Of course, the air raid scenes are the most intense, causing the room to shake with powerful explosions, gunshots, and soaring engines from all sides. Dynamic range is wide and distortion free, and bass activity is robust and full-bodied. There is a minor quirk, but the overall soundscape is very strong, offering a powerful and nuanced audio mix that really helps to enhance the film's aura of devastation and brutality. Trailer (HD, 2 min) - The film's trailer is included in 1080p with Dolby Digital 5.1 sound. 'Back to 1942' is a harrowing historical drama that sheds disturbing light on a devastating crisis, but the film frequently feels detached from the emotions of its characters. There are some intense set pieces, but the movie's sprawling scope could have used a bit more finesse and focus. Though decent, the video transfer is sadly held back by faint compression artifacts, and while quite effective, the audio features an odd anomaly in some dialogue. Outside of a trailer, there are no supplements. The distressing content can be hard to watch, but despite the scripting issues and mediocre video, there is enough value and substance here to warrant a look.